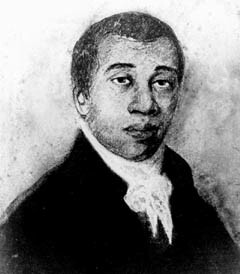 click image for close-up In 1784, the year of the first organizing conference of American Methodism, an unknown artist drew a chalk and pastel portrait of a young Richard Allen, founder and first bishop of the African Methodist Episcopal (AME) Church. Allen was twenty-five years old and an itinerant preacher at the time. The portrait was later owned by another AME bishop, Benjamin Tucker Tanner, who, nearly a century after it was painted, passed it on to his artist son, Henry Ossawa Tanner.